Gilbert once known for its farm land has become one of the highlighted suburbs of Phoenix! Gilbert's population growth is nothing short of remarkable; from 5,717 in 1980 to more than 242,955 in 2015. This rapid growth has sparked major investments into Gilbert's downtown infrastructure to include award winning restaurants, bars, nightlife, entertainment and shopping. Today you will still find the iconic water tower downtown and Heritage Square. Heritage Park hosts a variety of festivals and gatherings throughout the year. Gilbert was recently named the 2nd Safest City by Law Street Media and the 22nd and the Best Place to Live in the country by Money Magazine. Gilbert’s industries include Advanced Manufacturing, Aerospace/Defense, Bio-Technology, Clean Technology, and Renewable Energy. The K-12 education system including public schools, unique magnet and charter schools are nationally ranked. 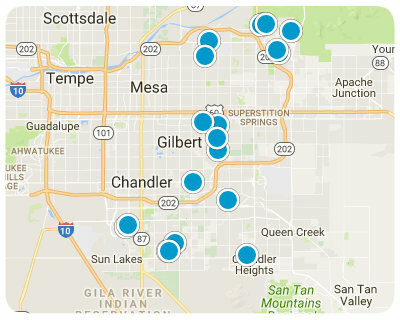 Below are ALL of the Homes for Sale and Recently Sold in Gilbert AZ from our Realtor MLS UPDATED EVERY 5 Minutes! That means EVERY home from EVERY Real Estate Company that is currently for Sale. You can also view ALL Homes for Sale in Gilbert, Gilbert Condos, Gilbert Foreclosures, Gilbert Short Sales, Gilbert Townhomes and Luxury homes in Gilbert. You can filter your search at the top by price, size, etc. Check out the popular 1-Click searches like Gilbert Homes for Sale with a Pool or Horse Property for Sale in Gilbert Arizona.